Check out our selection of accessible switches for people with hand dexterity issues. 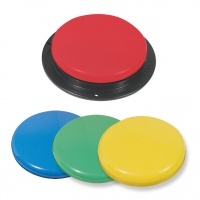 The Big Red Twist features a large, colorful 5 diameter surface area that provides a large target for users for whom smaller switches are difficult to use. It's ideal for students with visual, cognitive or physical requirements. An audible click signals the user that a cause-effect link has been made. With just a twist, switch tops can be removed and replaced with the color of your choice (Red, Blue, Yellow or Green) to suit your mood, style or unique vision needs.